Some quick thoughts on the 2013 Darioush Cabernet Sauvignon from Napa Valley. Back in 2004, Matt Kramer pegged Darioush Winery as “One to Watch” in his book New California Wine, and his words have proven apt as Darioush has become one of the “must visit” estates in Napa Valley. The winery was founded in 1997 in the Stags Leap District by Iranian immigrants Darioush and Shahpar Khaledi. The site of their winery on the Silverado Trail used to belong to Altamura Winery before the later moved down to Wooden Valley near the city of Napa. The 2013 Cabernet Sauvignon is sourced from estate fruit in Mount Veeder and Oak Knoll District AVAs and from hillsides vineyards in the greater Napa Valley AVA. The wine is a blend of 75% Cabernet Sauvignon, 17% Merlot, 3% Cabernet Franc, 3% Malbec and 2% Petit Verdot that spent 22 months aging in 85% new French oak. Around 9,155 cases were made. Medium intensity nose. Dark fruit (blackberry, black plum) with noticeable vanilla and oak spice. The mouthfeel is huge! Very full bodied and almost thick with high tannins and dense dark fruit. 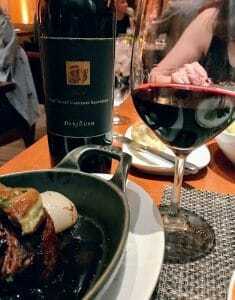 I felt like I was chewing this wine more than I was chewing my steak. Medium plus acidity added a saving grace of juiciness to keep my palate from wearing out. Long finish brought some spice. The Darioush Winery in Napa Valley. Like the wine they make, it’s BIG! Big, big, big wine with lots of character. It probably would’ve benefited from a good 2 hour decant which my dinner didn’t afford. Still, it paired well with my steak and was worth the restaurant mark up. At around $95-110 retail, it is worth the money for someone who wants a huge, brooding red wine that is almost a meal in itself. Tagged Altamura Winery, Cabernet Franc, Cabernet Sauvignon, Darioush, Darioush Khaledi, Malbec, Matt Kramer, Merlot, Mount Veeder, New California Wine, Oak Knoll District, Petit Verdot, Silverado Trail, Stags Leap District.